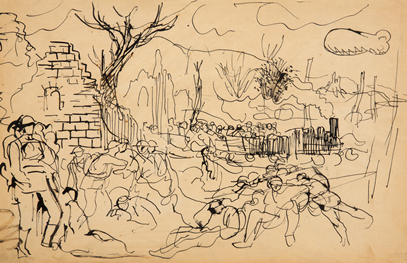 Art and Conflict brings together paintings and drawings from the Swindon collection which reflect on war and conflict. Art and Conflict explores a group of paintings, drawings and prints from the Swindon Collection of Modern British Art. The six artists of Cicatrix have each selected pieces that offer resonance with their own interests and practice. Their selection includes paintings by Tony Bevan, Graham Sutherland, Mary Kessel and Patrick Hayman. These choices are displayed alongside their exhibition, presenting further insights into Cicatrix, and a fresh interpretation of these included pieces by artists admired by the six collaborators. The exhibition also includes a number of drawings and prints by Augustus John, David Jones and Ian Hamilton Finlay, which explore war and peace.